Stronghold 2 got herself pregnant, the father? She can’t decide if Warcraft 3, The Settlers, or Banished is the father, and she is only in the first trimester so it’s impossible to tell currently, but she does have a name already picked out for the child; Folk Tale. Currently this game is in early access. Why is this important to say when that should be obvious? Because there are those, ah hell who am I kidding, MOST “gamers” don’t know what the hell that means apparently. Early access games can take six months, they can take five years, they might never be finished; picture it is like a kick starter but the dev is nice enough to give you free copies of their beta’s and alpha’s as they build the game. This is not a completed game and it may never be a completed game. A dev company can promise to “complete said game” but that is all it is, a promise, there is nothing legally speaking they have to do other than slap a “1.0” sticker on the game (Craft the World) and walk away. People need to know that and understand that going into any EA game. Here is a video from the developer going over their vision and roadmap for the game; it is extremely useful and informative. Currently the game has a tutorial and basically what I would describe as “Beta Maps”, four of them, which take anywhere from five to ten hours each to really complete. That means you are talking about twenty to forty hours of gameplay if you just gave each of their maps a shot. Don’t look at “how many hours” people have put into the game, many have put far more hours into the game than it says on Steam as for some reason the hours are just not clicking over correctly (offline mode possibly?). The three more sandbox style maps (Easily labeled on the side as easy/medium/hard) basically are set up just like most RTS games, you have a couple villagers and some supplies and build from there. Unlike most RTS games however (Other than Banished for some reason… for the life of me I don’t know why that game gets the reviews it does) Folk Tale currently does not have an “endgame”, ie. killing the enemy base, completing the mission, etc. Basically you build you city, survive and run amok as long as you desire/ can survive (ie. Banished) and that is that. Anyone who has played the Stronghold games will find this game strangely familiar, even the voice acting. The same style of walls, buildings, humor, villagers are not produced they just “appear” if you have the houses to support them and the happiness to attract them, etc. If I were to sum up the game currently I would say it is 50% Stronghold (Economy/Buildings/ Defensive Structures/Audio/Troops), 25% Settlers 7 (Economy Chains/Buildings/Villagers), 20% Warcraft 3 (Fantasy world/Combat), and 5% Banished (Possible sandbox?). (That’s a 100% right? Good…) If they threw together a random map generator and multiplied the map size by at least 3x this game would dwarf Banished in its content alone. The combat is vastly different from Stronghold, in favor of what I see as the developers taking a page from Warcraft 3. Instead of vast, vast armies you now command a smaller crew (with heroes in the works) that can all be personally equipped with gear and upgraded as they level up. I am assuming they will have a “Hall of Heroes” style building like Warcraft to bring your heroes back from the grave- hasn’t been implemented yet. So basically if you think you would enjoy a game that would have the combat and fantasy style world like that of Warcraft 3 while having the economy and base building of a Stronghold then I would strongly recommend supporting this game as I have not seen anything similar in years (Warcraft 4 is basically every modern day MOBA, no thanks, and the new Stronghold was a step back in every sense of “step back”) and I don’t know when or if you’ll see anymore. I have played AAA titles that were not as fined tuned as this game currently is, and those games have sold for over $50. 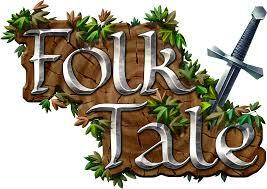 The developers of Folk Tale are claiming that they are still a long ways off from where they want to end up- that should impress and scare most of us.